It is relatively easy for me to be a Christian in the United States. I take for granted the privileges that I have: to worship, to congregate, to dress as I please with regard only to my own sense of propriety. This novel took everything that I understand about living for Christ and placed it under glass for reexamination. The novel opens with a Portuguese priest, Christavao Ferreira, apostatizing. What is that? It’s putting your foot on an image of Christ and denying that you believe in Him. Ferreira had been a priest in Japan for thirty three years, with tremendous influence and importance. He had three students: Garrpe, Santa Marta and Rodriguez. It is Rodriguez’ life as a priest in Japan that we most closely follow throughout the novel. He went willingly into a Japanese civilization where Christians are persecuted by the authorities. They fight poverty and hatred, hunger and rejection, but worst of all to me was the torture that was inflicted on those who believed. Some were hung suspended by crosses placed at the edge of the sea, so that when the tide came in they eventually died from struggling to breath above it. Others were wrapped in straw mats, rowed out into the ocean and thrown overboard to drown. Still others were suspended in pits, with incisions placed above their ears so that the blood could drain out slowly, drop by drop, making death exceedingly drawn out and painful. Rodriguez bravely faces all of this, convinced that he will endure, certain that he would never apostatize. Until the night that he hears the moaning of three Christians who have apostatized to no avail. They will hang suspended until Rodriguez himself denies his faith. But, don’t our actions reflect our hearts? How can we say we believe in one instance, and deny it in another? This is the terrible dilemma afflicting Rodriguez; he cannot bring himself to deny Christ, but neither can he bear the suffering of those suspended in the pit because he won’t. Tanabata is holding a read-along for this fascinating book on June 28. Won’t you join us for what’s bound to be a very thought provoking discussion? This is a book I've bumped up against again and again, although I've not read it.I can feel my mind going bump-bump-bump, too. Is silence the absence of words? Is silence the absence of The Word? Is taking back words the same as refusing to speak words? Can God unspeak His Word, once spoken?Now, how can I resist finding a copy of this one to read? How about these lines, Linda:"And then the Christ in bronze speaks to the priest: "Trample! Trample! I more than anyone know of the pain in your foot. Trample! It was to be trampled on by men that I was born into this world. It was to share men's pain that I carried my cross. "While I believe that He shares our pain, that He carried His cross for us, I could never say that Christ would give us permission to deny Him.I wish I could sit in the living room with every one for this discussion, instead of being confined in the boundaries of my screen. Bellezza, I won't be able to join Tanabata's read-a-long, but this does sound thought-provoking! This book sounds incredible! In the twenty-first century, in a lot of countries, religion and faith are personal things, which one doesn't have to justify to anyone else. Subsequently, it's something most of us take for granted. It's the same thing with so many other things – lifestyle, the role of women, education etc. that the mind boggles as to how dictatorial life was, some four hundred years ago. Bellezza, I just got back from church. Today's sermon was about worship. The preacher said, "God does not need our worship but we need to worship God." It struck me as true.If I were in that period where Christians were tortured because of their religion, it would be so hard to choose whose skin I'm going to sacrifice – my religion or my self?But then, can't I step on that man made picture but still keep my faith? There are a lot of connections here to a book I just read, David Mitchell's new The Thousand Autumns of Jacob de Zoet. Jacob sneaks a Psalter into Japan more than a century after this period, when censorship against Christianity is still very strict and, while there are still secret believers in pockets around the country, they continue to live in hiding. Prominent families in Nagasaki line up once a year for a ritual of stepping on Jesus's face as you describe.It strikes me as so political though–I can't help thinking it's much more of a formality than an actual rejection of one's faith. 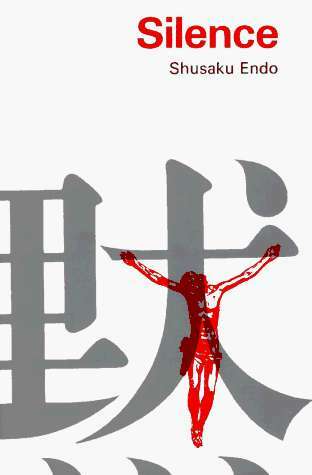 Yes, it is symbolic, but it's symbolic for the Japanese, not necessarily for the Christians. It seems most natural to me to take the view of living to fight another day, still having the chance to preach to more people and everything. Actions would only seem as important if you were demanded to something beyond the symbolic, like, say, actively murdering a fellow Christian.I'm sure your discussion will be a good one. You are the third person to recommend this book in a short time. I really should read it soon. I'm not sure if I could finish it before June 28th though. This sounds like a wonderful book! Thanks for the lovely review! I will add this to my 'TBR' list. It is really a difficult question – should one deny Christ (which will save the lives of some of his ardent followers) or should one refuse to deny Christ (which will result in some of his ardent followers getting killed)? Is it a good idea to pray and try to find out what Christ himself would have done in such a situation?My 21st century sensibility also asks me this – why would anyone want to convert others to a particular religion or belief? Why not leave them alone as long as they are peaceful and follow a belief system which is non-violent? Vishy, the last part of your comment reminds me of an intriguing line I read in this novel:"A tree which flourishes in one kind of soil may wither if the soil is changed. As for the tree of Christianity, in a foreign country its leaves may grow thick and the buds may be rich, while in Japan the leaves wither and no bud appears. Father, have you never thought of the difference in the soil, the difference in the water? "…"If the leaves do not grow and the flowers do not blossom, that is only when no fertilizer is applied." (p. 109)I must admit, I often wrestle with the idea of missionaries going overseas; first, there is much work to be done helping the impoverished in one's own country. Next, how do cultures receive one another's teachings with ease?I don't have the answers to the questions you ask, I ask, we ponder. That's one reason why this book is so great. It really causes one (me) to sift through one's beliefs. Read this a while ago & clearly need to read it again, thanks to your provocative review. Don't know if I can do it by the 28th, but it's worth a try…Love the new background and layout, Bellezza! I really enjoyed reading your comment, Bellezza! Thanks for that lovely quote! It is so beautiful and makes one think. I liked the last line "If the leaves do not grow and the flowers do not blossom, that is only when no fertilizer is applied." An excellent reply by the Father, I would say 🙂 I am more intrigued now and I would love to read this book. I am tempted to join the read-a-long too 🙂 Let me see whether I can get the book before that. Finished reading and still thinking about it. Such a provoking and heavy issue to me also. What would I do if I were in Rodrigues's shoes? Remember the lines Ferreira used to convince Rodrigues to apostatize.. that Christ would apostatize to save the lives of the Japanese Christians being tortured?The idea of Christianity not being able to take root in the soil of Japan. That when the roots are cut down, the idea of God changes shape. The God they worship becomes something/someone else. B, yes, I might also give comments offensive to non-Christians. I might not be posting, maybe the passages I posted will be it. But I'll be joining in the discussion at tanabata's or somewhere else.Rodrigues was struggling with God's silence, about not hearing their prayers and the pleas of the tortured Christians. It IS difficult to understand that in this world it isn't Christ that rules, but that the prince of this world is the prince of darkness. He gave man 6,000 years to try to rule themselves on their own. This is to prove that we cannot create an ideal world without Him. Life will always be filled with hardships and often we might think He has abandoned us, but we are looking forward to the coming world, not this one. Amen! This world is not our home.I read the quote you picked out and posted on your lovely dream song poem blog, and I remember reading that definition of sin in the book, too. I agreed with it, but expand it to include anything which is against God's will. (The apple in the garden of Eden, not bad in itself, only disobeying His direction not to eat it.) But, certainly, hurting man is sin as that quote so aptly pointed out. Yes, that quote did seem exclusive. It is only one type of sin, and yet it may also be a consequence of other sins. Eek! I somehow forgot to subscribe to your new home and just remembered to! You guys seem to have great discussion. Too bad I have to sit out on this one. But I will get to it soon or later. And I can always go back to read your thoughts again. Linda! After all these years of not knowing what to say, you've given me the perfect response! I'm so glad to finally have one. have not read this one yet, tho having read yours & Mel u's reviews I'm going to have to.which will make it my 3rd Shusaku Endo book, having just finished a collection of short stories by him- Stained Glass Elegies & have also read recently- The sea & poison, both books I thoroughly enjoyed & would reccomend heartily, both disturbing, provoking, challenging reads that make you re-appraise your ideas & belief systems.